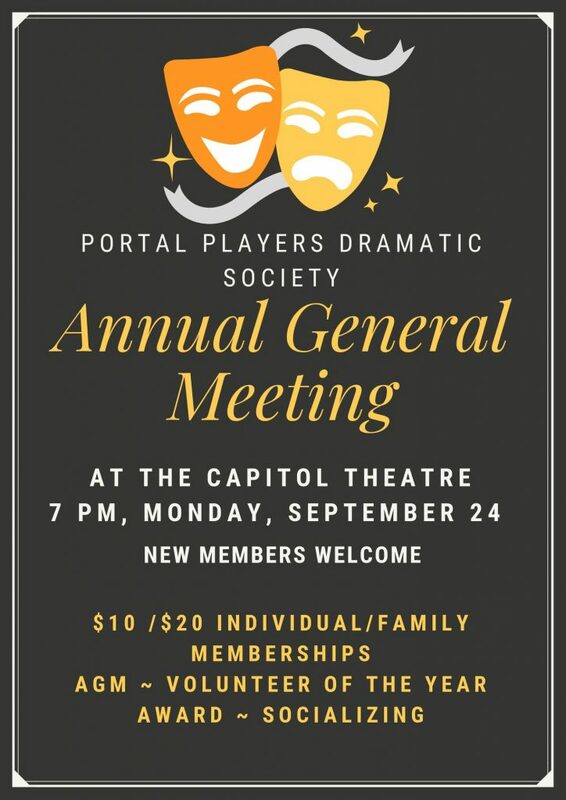 Portal Players Dramatic Society is holding its Annual General Meeting on Monday, September 24 at 7 pm, at The Capitol Theatre. New Members are welcome, as is the public – You’ll get to meet many of our members and hear our latest updates. You’ll also hear about Theatre BC’s big “provincials” of drama, the Mainstage festival, coming to Port Alberni next summer and being organized in large part by Portal Players. We’re still building the team and assembling a volunteer corps, so by all means, come to the AGM. Portal Players’ new season of plays kicks off in October with our production of the musical “Little Shop of Horrors”. Season tickets are available now for the entire series of four shows at a discounted price of just $69.00 for adults, a savings of $10 on individual ticket purchases. You could also purchase an individual patron sponsorship for just $129.00 which includes a season ticket, a membership in Portal Players and a $50 tax receipt. Buy your Season Tickets Here; buy your Opening Night Gala Ticket Here. Our annual campaign to partner with local businesses is now underway. This is an excellent opportunity for your business to support the arts while raising your own profile in the community, including promotional mentions on this, our new podcast. Affordable business support levels start at just $250, with higher levels available too. Click here for a downloadable PDF of our Partnership Packages brochure; or e-mail us: capitoltheatre@shaw.ca and someone will get back to you. Thank you to our season sponsors so far, Swale Rock Cafe, The Graphics Factory and Koliber Gifts. Another way you can show your support of Portal Players is to attend our Opening Night Fundraising Gala for “Little Shop of Horrors” on Wednesday, October 17. Not only is it our opening night, but we’ll finally be “Raising The Reds” with our new, marquee curtains at centre stage. With grateful thanks to Lily Diotte and our many other funders, it’s a night to celebrate! Tickets are just $50 which includes a $25 tax receipt – available online now and at our box office during regular hours. Portal Players is producing the Norm Foster comedy, “Looking”. Auditions are taking place on October 9 and 10 at 7 pm each night at The Capitol Theatre. 2 women and 2 men are needed for the cast; and we need members on our production team too – so if you have any interest in being on the stage, or off the stage, please attend the auditions to let us know. And you can also come to the AGM September 24 to let us know you’re interested. Find out more about “Looking” at this link. More “At The Capitol” Coming Soon . . .
Coming up soon on the At The Capitol podcast – a feature profile of three performers in Little Shop of Horrors. We’ll be chatting with our greek chorus, our tenacious trio, who are never far from the scene. Join me in chatting with Bronwyn, Melissa and Niklas very soon on At The Capitol with Portal Players. Portal Players SEASON TICKETS Now Available!